Williams AD, Ahuja KDK, Brickwood K, Fell JW. 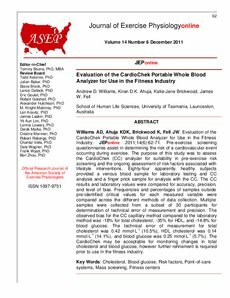 Evaluation of the CardioChek Portable Whole Blood Analyzer for Use in the Fitness Industry. JEPonline 2011;14(6):62-71. Pre-exercise screening questionnaires assist in determining the risk of a cardiovascular event occurring during exercise. The purpose of this study was to assess the CardioChek (CC) analyzer for suitability in pre-exercise risk screening and the ongoing assessment of risk factors associated with lifestyle interventions. Eighty-four apparently healthy subjects provided a venous blood sample for laboratory testing and CC analysis and a finger prick sample for analysis with the CC. The CC results and laboratory values were compared for accuracy, precision, and level of bias. Frequencies and percentages of samples outside pre-identified critical values for each measured variable were compared across the different methods of data collection. Multiple samples were collected from a subset of 30 participants for determination of technical error of measurement and precision. The observed bias for the CC capillary method compared to the laboratory method was -18% for total cholesterol, -35% for HDL, and -14.8% for blood glucose. The technical error of measurement for total cholesterol was 0.42 mmol·L-1 (10.5%), HDL cholesterol was 0.14 mmol·L-1 (14.1%), and blood glucose was 0.25 mmol·L-1 (5.7%). The CardioChek may be acceptable for monitoring changes in total cholesterol and blood glucose, however further refinement is required prior to use in the fitness industry.